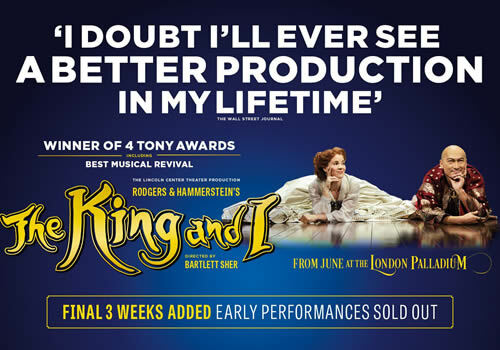 Bartlett Sher’s Tony Award-winning production of Rodgers and Hammerstein musical The King and I receives a highly anticipated West End revival at the London Palladium. Originally premiering at the Theatre Royal Drury Lane in 1953 and last seen at the London Palladium in 2000, starring Elaine Paige, the revival marks the original production’s 65th anniversary. 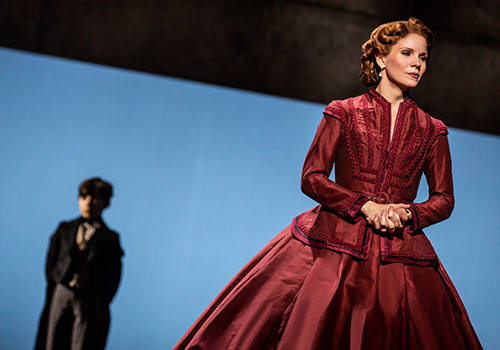 Based on Margaret Landon’s novel Anna and the King of Siam, The King and I takes place in 1860’s Bangkok, and sees Anna arrive to tutor the King’s many children at his request. As the pair constantly find themselves at war with each other, and tensions rise, an unexpected romance begins to blossom between them. With a book by Oscar Hammerstein II and music and lyrics by Richard Rodgers and Hammerstein, the score features show-stopping numbers including “I Whistle a Happy Tune”, “Getting to Know You”, “Something Wonderful” and the iconic “Shall We Dance?”. 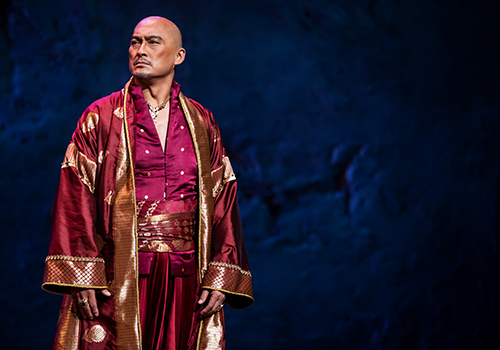 Kelli O’Hara and Ken Watanabe star as Anna and the King, reprising their performances after appearing in the 2015 Broadway production at the Lincoln Center, for which O’Hara earned the Tony Award for Best Lead Actress in a Musical. Her credits include Broadway musicals such as The Bridges of Madison County and South Pacific, whilst Watanabe is best known for his blockbuster films, including Batman Begins and Inception. Further casting includes Ruthie Ann Miles as Lady Thiang, Dean John-Wilson as Lun Tha and Na-Young Jeon as Tuptim, as well as Takao Osawa as The Kralahome, Jon Chew as Prince Chulalongkorn, Edward Baker-Duly as Sir Edward Ramsay and Captain Orton, and Annalene Beechey. Ensemble members include Kamm Kunaree, Jacqui Sanchez, Miiya Alexandra, Ena Yamaguchi, Ela Lisondra, Aiko Kato, Lily Wang, Yuki Abe, Saori Oda, Misa Koide, William Mychael Lee, Alistair So, Arthur Lee, Jorge Sprangers, Jonathan Caguioa, Cletus Chan, Jesse Milligan, Nick Len, Steven Hardcastle, Nicholas Li, Rachel Jayne-Picar and Jasmine Leung. 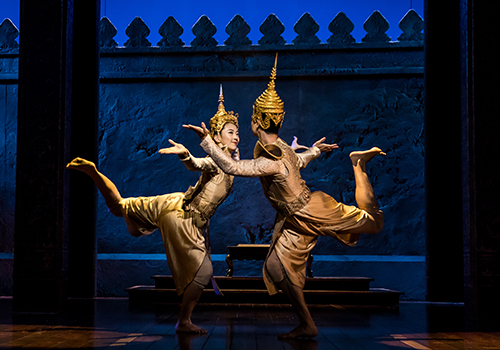 The King and I is directed by Bartlett Sher, who most recently helmed the Tony Award-winning Oslo. The production features set design by Michael Yeargan, costume design by Catherine Zuber, lighting design by Donald Holder and sound design by Scott Legrer, as well as choreography by Christopher Gattelli, which is based on the original choreography by Jerome Robbins. 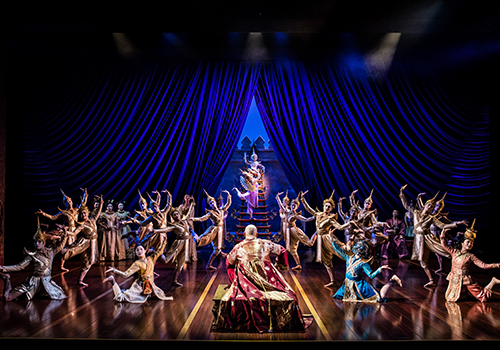 Playing at the London Palladium for a strictly limited season in summer 2018, The King and I is one of the most highly anticipated revivals of the year. The musical runs at the West End venue from June 21st to September 29th 2018, with an official opening July 3rd 2018. Under 5's will not be admitted into the auditorium.